Charge, and connect, your Type-C devices with this three-foot USB (2.0) Type-C to Type-A cable. Transfer your music, photos, and even movies with high-speeds of 480 Mbps. 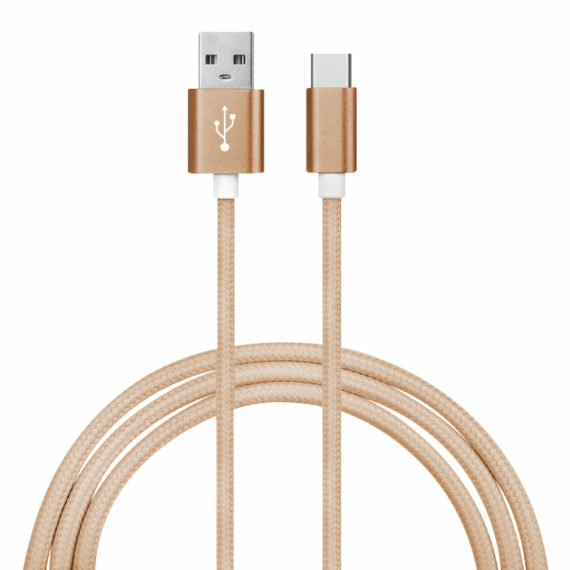 Feel free to move around, and bend your cable without worry, with this nylon-braided cable. Built for durability, this tightly-woven nylon cable is easy to unravel, and resistant to wear. The solid joint between metal connector and nylon jacket serves to prevent fray, and helps make the cable more pull-resistant. This cable is currently available in: black, white, pink, or gold. Compatible with: Samsung Galaxy S8, Samsung Galaxy S8 Plus; LG G6, G5, V20, LG Nexus 5X; Huawei P9/P9 Plus, Huawei P10/P10 Plus, Huawei Mate 9, Mate 10 Pro; Google Nexus 5X, Nexus 6P, Google Pixel, Google Chromebook Pixel; Lumia 950, Lumia 950XL; OnePlus 2, 3, 3T; ZTE Axon 7, Moto Z2 play, HTC 10, Nokia N1, Asus Zen AiO, Lenovo Zuk Z1; Nintendo Switch, new MacBook, and even more USB Type-C cable devices. Available in black, white, pink, or gold.